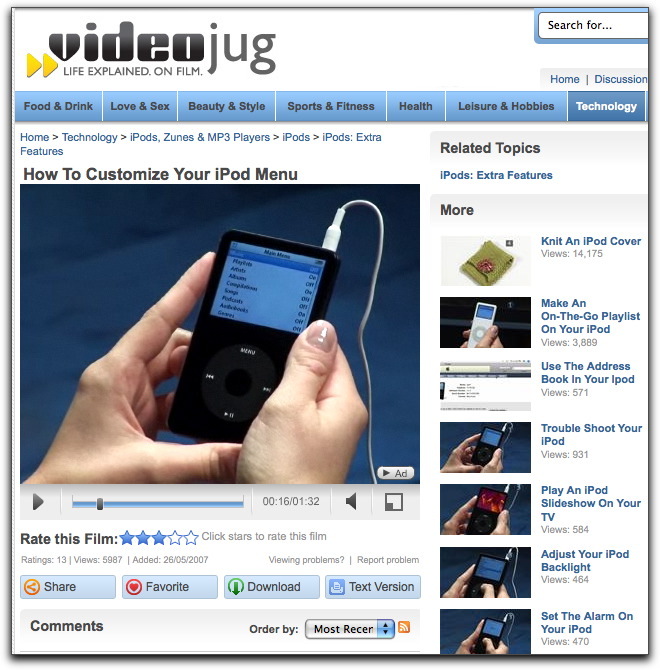 Yesterday I learned a brand new trick to teach my iPod that I’ll get to in a moment; what I found interesting was where and how I learned it: at videojug.com. Now I could explain the trick – adding items to my iPod’s top menu – in a couple hundred words or so, but why when I can point you to a 90 second video on this site and it can teach you better than I can? Not to mention some 16 pages more (approximately 136 videos) of things you can do with your iPod that maybe you didn’t know about. Videojug is all about showing you how to do something useful, like negotiating your next pay raise. “We could have allowed in 10 million cat videos, which are interesting and cute, but we’d rather show you one video on how to build a cat door,” Kamin added. The site has the usual commenting/discussion/rating infrastructure every self-respecting Web 2.0 site has, with the added incentive of monthly cash prices for the best of community-submitted videos. Like YouTube, you can embed VideoJug videos in blogs, web sites and such. The company, initially funded with $30 million of mostly european private investor capital leaped the pond from London in 2007 and now has a U.S. office in Los Angeles. It makes its money off of a combination of online advertising and sponsored videos by various companies including Microsoft. Nice! I’m getting an ipod soon too, maybe I’ll use this.